Thursday 27 - Sunday 30 June 2019, 10am - 6pm . 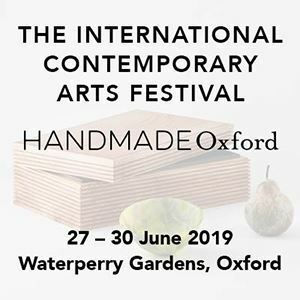 Handmade in Britain is pleased to present Handmade Oxford - The International Contemporary Arts Festival, 27 - 30 June 2019, at Waterperry Gardens, previously the home of internationally-renowned Art in Action for 40 years (1977 - 2016). Tickets for our programme of workshops and talks are available after selecting an admission ticket. Please access these by following the purchase process through. All tickets include access to the formal gardens at Waterperry. Free entry for ages 16 and under, with an accompanying adult. Valid on any single day of the festival between Thursday and Sunday. Early Bird Discount Senior Citizens (60 and over), Students, Ages 17 -18, Registered Unemployed, and disabled people (with free entry for one carer) are entitled to a concession discount. If purchasing a concession priced ticket(s), please ensure that the person the ticket/s is intended for meets the correct criteria and brings proof of eligibility on the day(s) of attendance. Early Bird Discount Visitors with disabilities may admit one accompanying carer free of charge when they pay for a full adult ticket. Proof of eligibility (blue badge / DLA letter) and ID must be presented with tickets on entrance to the festival. Early Bird Discount Free entry for ages 16 and under, with an accompanying adult. Valid for entry to the event any two days between Thursday and Sunday. Valid for entry to the event Thursday - Sunday. Season ticket and ID must be presented along with ticket on entrance to the festival. Any friends of family accompanying must purchase a full priced ticket. Early Bird Discount Valid for entry to the event any two days between Thursday and Sunday. Early Bird Discount Valid for entry to the event Thursday - Sunday. Membership / proof and ID must be presented along with ticket on entrance to Festival. Any family or friends accompanying must purchase a full priced ticket.